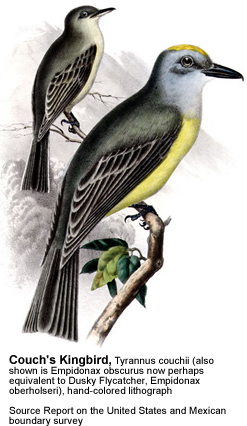 The Couch's Kingbird, Tyrannus couchii, isa tyrant flycatcher found from southern Texas along the Gulf Coast to the Yucatan Peninsula in Mexico. 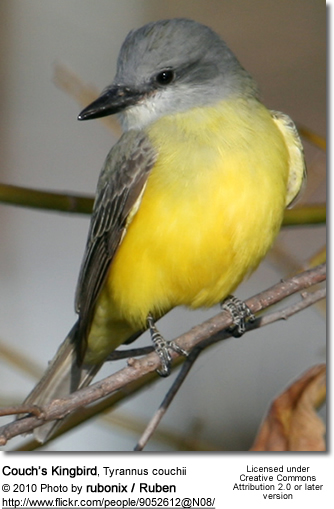 The Cough's Kingbird measures about 7 inches in length. It has a large head and bill. It has a dark, forked tail. The head is pale grey with contrasting darker cheeks. 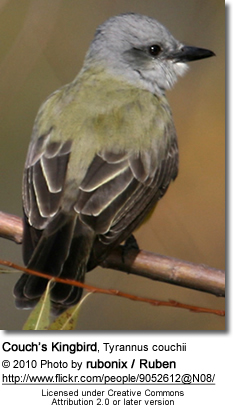 The upper plumage is greyish-olive. The throat is pale. Te upper chest is darker-colored. The lower breast is bright yellow. Juveniles have a browner under plumage than the adult and pale edges to their wings.